HH Sheikh Mohammed bin Zayed Al Nahyan, Abu Dhabi Crown Prince and Deputy Supreme Commander of the UAE Armed Forces, last night officially inaugurated Ferrari World Abu Dhabi, the world’s first Ferrari theme park, on Yas Island. “The ambitious development projects in progress in Abu Dhabi will help position the Emirate prominently on the global map as a sought after tourist destination. Ferrari World Abu Dhabi is a quality addition to our tourism industry which is one of the pillars of our national economy,” Sheikh Mohammed said. Hosted by Aldar Properties and Ferrari SpA, the event attracted 2000 VIP guests including HH Sheikh Hamdan bin Zayed Al Nahyan, the Ruler’s Representative in the Western Region; Lt. General HH Sheikh Saif bin Zayed Al Nahyan, Deputy Prime Minister and Interior Minister; Sheikh Dr HH Sultan bin Khalifa Al Nahyan, Member of the Executive Council; HH Sheikh Mohammed bin Khalifa Al Nahyan, Chairman of the Finance Department; Sheikh Nahyan bin Mubarak Al Nahyan, Minister of Higher Education and Scientific Research; Sheikh Ahmed bin Saif Al Nahyan, Member of the Executive Council; Sheikh Sultan bin Tahnoon, Chairman of Abu Dhabi Tourism Authority; Mohammed Ahmed Al Bawardi, Secretary General of the Executive Council; and senior government officials. Guests including Mr Franco Frattini, Italian Foreign Minister; Giorgio Starace, Italian Ambassador to the UAE; Mr Luca di Montezemolo, Chairman of Ferrari; and Ferrari Formula 1 team drivers Fernando Alonso and Felipe Massa were treated to a spectacular show to celebrate the achievement of Aldar and Ferrari in delivering the world’s largest indoor theme park. The show – titled Power meets Elegance – was inspired by the history of Abu Dhabi and the story of Ferrari. 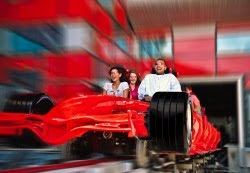 Seen through the eyes of a young boy, the vision-like story weaves these two strands together to the fulfilment of the dream of Ferrari World Abu Dhabi. The two cultures are blended together through an incredible mix of live action, acrobatics, advanced film projection techniques and original music. The show starts with an incredible aerial dance of the traditional UAE pearl divers surrounded by a 3D marine world projection. The atmosphere then escalates into a magnificent dance of flying dancers and Ferrari engine pistons arriving to the first climax when Puccini's "un bel di" is sung by an opera singer. HH Sheikh Mohammed bin Zayed Al Nahyan launched the grand finale which explodes with an incredible series of gigantic projections, flying pearl divers, live orchestra and a unique and amazing firework display that enhances to the rhythm of the music the whole Ferrari World Abu Dhabi building. Following the spectacular show, HH Sheikh Mohammed toured the park, intermingling with the guests and congratulating the developers for what he termed as an outstanding achievement. A record number of more than 140 Ferraris travelled across the United Arab Emirates to join the event guided to Yas Island by Abu Dhabi Police. Ferrari Middle East & Africa in association with Al Tayer Motors, the official Ferrari importer for the UAE, and the Emirates’ Ferrari Owners' Club organized the event as a tribute to the grand opening of Ferrari World Abu Dhabi. meeting of minds with a clear vision to create an experience that is unique, fun and inspirational. This unique new attraction at the heart of Yas Island is creating excitement, not just here in Abu Dhabi, but around the world. With more than 500 million people watching the final race in this year’s Formula 1 season only three weeks ago, the eyes of the world will instantly recognize this amazing structure. “I would like to thank all those who made this dream a reality, and in particular our partners and the leadership of Abu Dhabi. The park just 4 years ago was a project, an idea, maybe even a too ambitious idea, and it is now a fantastic reality. We are very proud of our partners Aldar who share with Ferrari the same passion, the same vision, the same will to go beyond. This park combines innovative technology and tradition; it is dedicated not only to Ferrari fans and car enthusiastic, but to the whole family. It has the real touch of Ferrari: how things really are for us, with our exclusive GT road cars and racing cars, but also our history and our cultural background.